Jenkins Build Pipeline Plugin was developed for better support of the Continuous Integration process. This plugin allows to form a chain of jobs based on their upstream/downstream dependencies. You can also see a history of pipelines in a view, the current status and where each version is in the chain based on its revision number. For details see the Jenkins documentation. WAPT Pro supports the Jenkins Pipeline Plugin. You can write a Pipeline script which calls some command. In particular, you can write a script which calls the commands of running a test scenario, archiving build output artifacts and publishing WAPT Pro reports. Note. You should have the Build Pipeline Plugin installed in your Jenkins console. Type a name for your new job and select the option Pipeline. Then click "OK". In the Pipeline section, select the option Pipeline script and enter the script. This script has 3 stages. The first stage runs WAPT Pro scenario, the second - archives the build output artifacts and the third - publishes WAPT Pro report. bat "\"C:\\Program Files\\SoftLogica\\WAPT Pro 5.0\\WAPTPro.exe\" -run \"jenkins.wpsx\" -sr \"results\\testscenario.wprx\" -hr \"results\\report.html\" -noui"
stage "Archive build output artifacts"
Save the new Pipeline item. It will appear in the list of items in the Jenkins console. In the example above we used a command which archives the build output artifacts and a command which publishes WAPT Pro report. 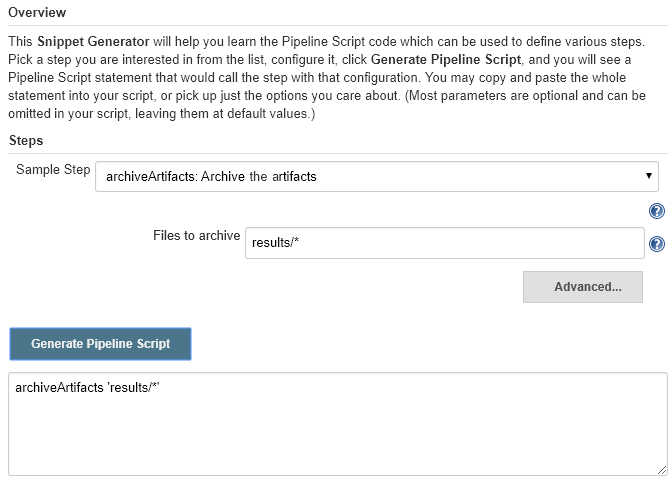 Click the Generate Pipeline Script button, and you will see a Pipeline Script statement that would call the step "Archive the artifacts". You can copy this statement and paste it into the Pipeline scripts of your items. 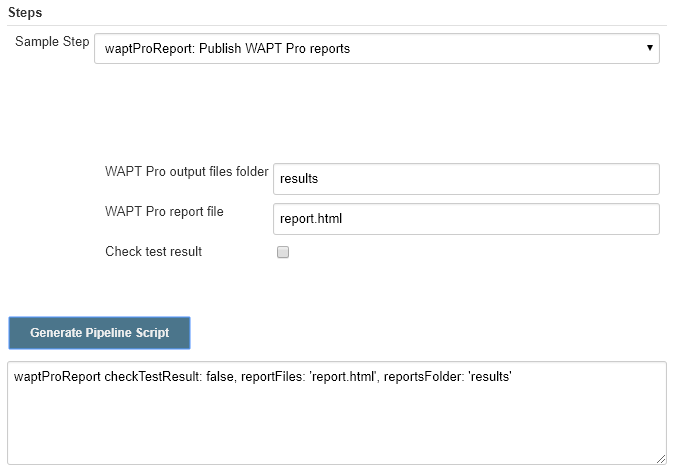 Click the Generate Pipeline Script button, and you will see a Pipeline Script statement that would call the step "Publish WAPT Pro reports". You can copy this statement and paste it into the Pipeline scripts of your items. The Stage View of a pipeline item shows the run time and stage statistics. Names of columns are the same stages that were defined in the Pipeline script: (1) Run scenario, (2) Archive build output artifacts	and (3) Publish Report. You can see the average times for each stage and also the average full run time.